" rather that "beguns"). Some web browsers have problems displaying superscripts. Pull the cursor over them to get the footnote window to appear. Introduction WE have now arrived at the nave of the church, which exhibits one of the most curious instances of transformation from one style of architecture to another that has been preserved to us. For although at present a complete and perfect specimen of the fourteenth and fifteenth centuries, it is yet in the heart and core of its structure from the ground to the roof the original Norman building commenced, if not completed, by Bishop Walkelin. To develop and explain the nature of this singular state of things is the object of the present chapter. For although it has been pointed out by Milner and subsequent writers, there are many particulars that appear to me to have escaped observation, and the whole process is so curious an example of the modes of proceeding in the middle ages, that it deserves a very minute examination. And first for the history. Some work had previously been carrying on at a great expense in the year 1371. footnote z But Wykeham's work was undertaken in the year 1394 footnote a and entered upon in the beginning of the following year, upon certain conditions stipulated between him and the prior and convent, footnote b which will presently appear from his will. He died on the 27th of September, AD 1404, leaving, as it appears, the work unfinished, but it was carried on and completed by his successors. The few particulars which I have just extracted from Lowth serve to shew that this bishop was connected with Winchester from his youth, and also that he was essentially a practical man, and engaged in architectural works of the most extensive kind all his life. This gives an additional interest to the works in question, because we may imagine that the mode of proceeding was his own device, and that the designs were mainly due to him. Now although he is recorded by his biographers footnote c as having erected the nave as we see it, it is plain, from various evidences, that this assertion must be taken loosely, to mean that he had the greatest share in its construction. The best information concerning the exact state of the works at the time of his death, and the mode in which they were carried on, is furnished by his will, and accordingly I shall proceed to extract and translate all those portions of that document that relate to the cathedral. It is dated at South Waltham, July 24, 1403, about fifteen months before his death, footnote d and nine years after his part of the work was begun. Item. I desire that my body be buried in the middle of a certain chapel by me newly erected on the south side of the nave of the cathedral church of Winchester. Item. I will and ordain that my executors shall cause to be reconstructed the body or middle part of the aforesaid church, between the north and south aisles, from the west door of the choir downwards as far as the west end, in its walls, windows, and vault, handsomely and well, according to the form and manner of the new work of the aforesaid aisles now begun, and they shall also complete the said aisles through the same extent in length. And they shall expend upon the work as much as 2,500 marks, if so much be required for its completion in the form and manner above defined. It being premised, however, that the prior and convent of the church shall provide all the scaffold necessary and convenient for the work ; also, that they shall freely and without charge permit lime and sand to be taken by the workmen sent by myself or my executors, from any part of the lands of the convent or of their tenants, where it is of the best quality; also, that the stones, lead, iron-work, timber, glass, or any other of the materials which the old building may yield entire, shall remain, and be employed in the new work. And I will and ordain that the arrangement and conduct of the new work shall be entrusted to Master William Winford, and such others discreet, sufficient, and approved in their art, as may be chosen, if necessary, by my executors. Also, that Dominus Simon Membury, now supervisor and paymaster of the work, shall continue in the same offices under the supervision and control of Brother John Wayte, monk of my said church, and at present controller of the work on the part of the prior and convent, so long as he shall continue in good health, but when he becomes unfit or unable to work, then the prior and convent shall appoint some other monk of the said church to succeed him as controller so long as the work shall last. And the payments shall be made from time to time, according to the discretion of the whole of my executors, or of any five at the least. The west front of the present nave, together with two windows and the three buttresses that belong to them on the north side of the north aisle, and also one window on the south side of the south aisle, are very different in design from the rest of the work. This portion may therefore be attributed to Bishop Edingdon. 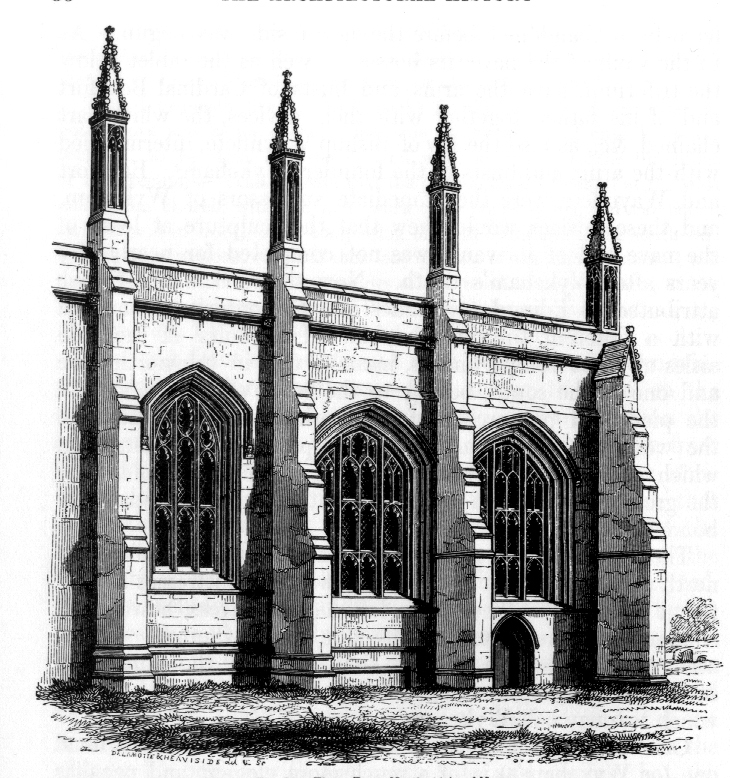 And it will be remarked, that in Wykeham's will just recited, he carefully desires that the windows of each aisle are to be glazed, beginning at the western most window of the part which he himself has erected, thereby excluding the windows that had been erected by his predecessor, and probably glazed by him. Beaufort and Waynflete were the immediate successors of Wykeham, and these devices would shew that the sculpture at least, of the nave and of its vault, was not completed for nearly fifty years after Wykeham's death. Now the work which I have attributed to Edingdon includes only the outer wall, marked with a different tint in the plan. The vaults of the side aisles of these compartments, namely, two in the north aisle and one in the south, belong to the work of Wykeham, and the piers and pier-arches of his work extend completely to the west end, and include the two responds or half piers from which the western pier-arches spring. These responds join the great west wall with a straight joint, and are not apparently bonded thereto. The view ...[at left] represents the outside of the wall of the north aisle at the west end. It shews four buttresses all different from each other. The left hand buttress, however, is similar to all the others on this side of the Church. In the other three there is a general similarity, but the number of set-offs is greater by one, than in the left hand buttress, which we may call Wykeham's. A set-off in the wall above Edingdon's windows is seen, which marks the upper boundary of his remaining work. The pinnacles and upper set-off of his buttresses were added by Wykeham, and resemble the others. But the last buttress and pinnacle apparently remain in the state in which Edingdon left them. The moldings of the windows in question, both within and without, afford a very useful test of the different powers of the artists that designed them. In the interior the moldings also differ. Edingdon's begins with a brace-molding, and Wykeham's with a triple group. The monial-mold of the first is more complex than that of the second, and the boutells of the first are flanked by a fillet and sharp edge, which is wanting in the second. The base moldings given to the shafts of Edingdon's work in the interior are entirely different from those of Wykeham. In the figure of bases [ Figure 39 ], I is Edingdon's, K and L are Wykeham's. The first consists of two slender casements only. The last has, in addition to a broader casement below, a molding above, which is wholly wanting in the first. 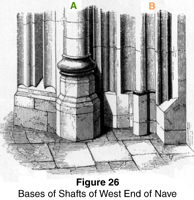 In the figure, L is the mold of Wykeham's wall-side shafts, and K the mold that belongs to the great shafts of his piers. 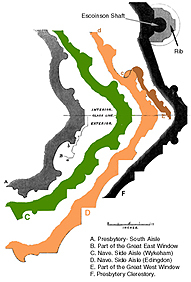 In figure 26. [left] a part of the wall is sketched from the west end, where Wykeham's work unites with Edingdon's. A is one of Wykeham's shafts with the complex mold, and B one of Edingdon's with the simpler mold. Another difference is to be found in the heads of the panels in the two works, and also in the arch-heads of the lights in the windows. The following figures respectively represent the arch-heads of the two works, fig. 27. of Edingdon and fig. 28. of Wykeham. The points of the cusps in Edingdon's work are decorated each with a small leaf. In Wykeham's work they are each plain. 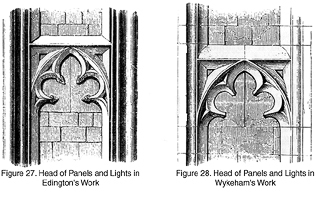 In Wykeham's panels the masonry of the panels itself is carefully finished, and the same stones serve in fact for the ground of the panel and for the moldings; but in Edingdon's panels the monials and tracery only are framed of good masonry, and the panels are filled up with rough ashlar. Now by means of these tests it becomes perfectly evident that the great west window, with the western porches, constitutes a part of the same work as the lateral walls and windows that have just been attributed to Edingdon, and that these works are totally different from the portion that belongs to Wykeham. The flowered cusps are employed throughout the entire west window, from the panels below to the head above, and also throughout the western porches: as well as throughout the windows of the walls of the side aisles at the three western compartments already mentioned, and also for the two western windows of those aisles. The small slender base prevails throughout these parts alone, and runs all through the western porches. The moldings of the great west window only differ from those of Edingdon's side aisles in the manner shewn in figure 25. They are identical from d to c, but from c to E, although the moldings are alike, those of the great window are thrown a little farther outwards from the jamb, to allow apparently for the greater magnitude of the work. From all these indications I am confident that the west front forms one design with the two compartments on the north and the one on the south, and that it must be therefore attributed to Edingdon. I am inclined to think that the gable and turrets were not finished by him; and there are curious indications of change of plan about them, which are very difficult to disentangle. The external jamb of the great window has exactly the same moldings as those of Edingdon's side aisle windows (D, fig. 25,) namely, the two great casement moldings. The design of the west window is singularly simple, reducing itself to the merest stone grating. Divided into three great vertical compartments by principal monials, each of these is again split into three by secondary monials. Seven transoms divide the space into eight horizontal compartments. But the door in the centre and the arch-heads of the lights disturb the regularity of those at the top and bottom of the window. The window sill coincides with the second transom from the bottom, consequently we have panels below it and lights above it; then we find four rows of nine lights each, all alike, and above these the arch-head, which can scarcely be said to be filled with tracery, so completely does the grating-like character pervade it. In fact, in the central group of lights the grating extends to the very top, as well as in the middle of each great lateral division, the only attempt at curvilinear tracery being the filling up of the two side subordinate compartments of each great lateral division; and this, as it happen-, to coincide with the similar parts of Wykeham's aisle and clerestory windows, has been thought by some writers enough to identify the two as the works of the same person. It appears from recent investigations that the west front of the Norman cathedral extended about forty feet in advance of the present one. Some raised ground in front of the western doors, and remains of walls in an adjacent garden, have long given rise to an opinion that this might be the case; but Mr. Owen Carter has lately excavated the ground and traced the foundations, which are shewn in a light tint in my plan, and which I have copied from a sketch, for which I am indebted to the kindness of that gentleman. These foundations shew a wall of 128 feet from north to south, and 12 feet thick, with returns at each end, of the same thickness, 60 feet in length. At their eastern ends the walls again turn at right angles, and meet the present side aisles at 17 feet from each corner. Within the parallelogram thus partially traced two other walls run from east to west, at a distance of 36 feet from each other. At the northeast angle c, the excavation uncovered the plinth represented in the margin. This plinth consists of two plain faces with chamfers, and corresponds exactly in profile and in level with the Norman plinth of the south transept. The figure [at center] shews the relative level of the pavement and base in the interior of the north transept, as nearly as can be indicated, for the level of the pavement varies considerably. In a garden adjoining the west end of the cathedral, part of the south-west angle of the walls still remains, to' a considerable height above the ground, as shewn by the darker tint... But this is a mere mass of rubble stripped of ashlar. These foundations must either have belonged to two western towers, or to a kind of western transept; and this construction, whatever it was, having been in all probability either left unfinished or threatening ruin, Edingdon was induced to take it down, and replace it by the present west front. Similarly at Gloucester cathedral the western towers were removed, and replaced by the present Perpendicular west front at the beginning of the fifteenth century. Transforming the Nave from Norman to Perpendicular I shall now endeavour to explain the transformation of the nave from Norman architecture to Perpendicular; and I use this word advisedly instead of rebuilding, for it will be shown that the Norman core still remains in the piers and walls up to the parapet, and in many places the Norman ashlaring as well. Many of the piers on the south side, namely, the eight westerly ones, including the half pier, retain the Norman ashlaring, upon which the new moldings have been wrought. The Norman arches still remain behind the triforium. 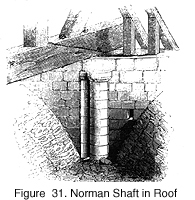 Norman shafts still remain above the present vault, as shewn by the annexed sketch, [Figure 31] taken between the stone vault of the nave and the wooden roof, and representing one of the pockets, as they are called, of Wykeham's vault. Lastly, on the outside of the clerestory the Norman masonry and flat buttress may be seen running up between the Perpendicular windows. Besides, as already stated, in the neighbourhood of the rood loft, Norman shafts, once covered by the constructions appended to that edifice, are still to be seen, footnote k and in like manner in the, southern side aisle part of the lower extremity of a Norman shaft appears, as shewn in the margin; this having been probably covered by some shrine or altar work. From all these and similar appearances we are justified in saying that this part of the building was merely transformed, instead of being, as was the case with Canterbury nave, footnote lsimply pulled down and. rebuilt. I mention the nave of Canterbury because there is a very singular resemblance between the history of the two naves. Comparing for example the compartment of Canterbury nave' with the compartment of Winchester nave shewn below in page 71, the general arrangement of the two compositions will be found the same. But the pier arch moldings of the former are much lighter and the piers more slender than those of the latter. This is due to the different construction, the one having been completely rebuilt, the other being a mere casing or refacing of a heavy Norman structure. So also the balcony of Winchester does not appear at Canterbury, and the paneling of the combined triforium. and clerestory above, which in the former is set back in the middle and enriched with a frame of moldings, in the latter is all in ODC plane, because in the first case a thick Norman wall was to be dealt with and disguised. But the pattern of the tracery is the same in both examples, only that the Canterbury transom is higher in proportion. Also in both the opening of the triforium. is pierced through the panel. The remainder of the piers on the south, and the whole of the piers on the north side of the nave, are now cased with ashlar from the pavement upwards. (It must be remembered that Wykeham's will has shewn us that he began his work on the south side.) By this time the Canterbury nave must have been carried up to the pier-arches, and as their clerestory was changed to a pattern resembling that of Winchester, while Winchester remained the same in side aisles and clerestory, it is fair to conclude that the first was copied from the last. As to the lierne vaults which both examples are covered with, and the invention of which some have attributed to Wykeham, they were employed in Bishop Hothams work at Ely, about the year 1336, and in Gloucester cathedral a few years earlier, namely, when Wykeham was about ten years old, footnote o not to mention their universal employment in Germany and other parts of the continent. The plan of the pier of the nave (fig. 33. below) will shew how small the difference is between its original state and the present, and how great was the skill that enabled the architect to transform the heavy pier of the Norman work into a structure of so totally different a style. The lower or tinted [green] half of this figure shews the pier as it stands, and below it is a profile of its arch-mold. But the upper half of the figure is double, and represents the present plan in comparison (by superposition) with the Norman pier. The difference between the two plans being tinted [in blue] shews the portion of the old pier which was chipped away to convert it into the new one. The outlines which circumscribe both the upper half and the lower are the plans of the respective plinths ; the Norman plinth being as usual disposed in successive squares, and the Perpendicular one in successive portions of octagons, which are equiangular under shafts, and irregular -under the intermediate moldings. If the Norman pier of the nave, as shewn in this plan, be compared with that of the Norman transept already given in fig. 3, above, it will appear that with one exception they are alike. In fact, from I to D (the same letters are placed on corresponding parts in both figures), they are identical. But in the nave-pier an additional square edge C is introduced, which does not appear in the transept. The shaft A and the square edge B behind it are the same in both.